Shame on Lake County Florida Democrats desecrating Old Glory! This is not 2008 and Democrats cannot get away with desecrating our American flag with the face of Obama. Those of you in Florida should march and protest and demand this ridiculous flag be burned. Posted in Politics, Young conservatives & libertarians | Comments Off on Shame on Lake County Florida Democrats desecrating Old Glory! EVERY AMERICAN PRIEST SHOULD TALK LIKE THIS!!!!!!! What information on Obama did Andrew Breitbart have? Obama has been promising to trash Tricare since he was immaculated. You liberals in the military are getting what you voted for, while civilians employed by the military (that is, those in those protected unions) will not be affected. Papa and Barbara Bush should be ashamed of themselves—at least they should quit asking for money from conservatives. When will the pope excommunicate this heretic? Contemplating an abortion? Read this first…. 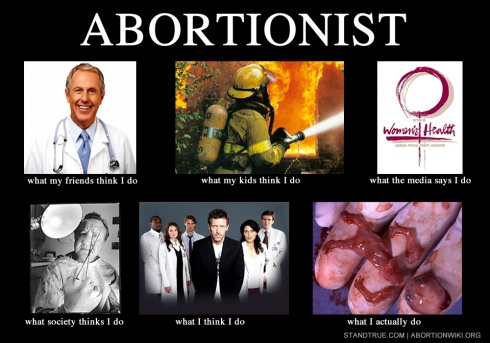 Abortionist–when do you think life begins? Posted in Healthcare, Politics, Religion, Uncategorized, Young conservatives & libertarians | Comments Off on Abortionist–when do you think life begins?